The opening trick in this gorgeous ebook is just cool. A mini bet in which 2 bands are shown around the card case width ways. One will win the spectator $100 and the other one will win the magician $100. One is selected by the spectator without equivoque. Of course it's just a normal band. The other is removed and there is a $100 bill attached. Such a mini trick but so hard hitting. The best thing? It's brilliantly clever. Very simple and uses some very old methods in band magic but in a completely new way. A couple of effects follow suit and indeed use the same sort of principle. Sleight of Band. Another stunning effect and really can be imagined as a one trick download on one of these new polished sites. It's just wicked. A band that's wrapped around the deck lengthways rises up and down the deck. It begins wrapped around the whole deck. With a wave, it's seen to jump up through the deck and now be wrapped around just half of the deck. It continues to jump up and down the deck in an incredible way. It really is an awesome trick. Rising card plots have been on the increase in recent years. But what better way to do it then with the elastic band. It's fast growing to take over Ben's normal rising card trick. The final is one of he best in the ebook. A card visually slices through a rubber band and restores. It looks mad. Another one for the download generation. A great stand alone effect or in a routine. Of course every single one of the effects can be used as part of a routine and Ben gives credits and additional thoughts all the way through his ebook. 1st edition 1987; 32 pages; 49 photos. So, Ben Harris gets into rubber band magic. Surely it’s all been done before. Of course there’s Bands going through each other, rings on bands and all the other cliché rubber band classics. But what’s that? Ben likes cards FAR too much? Of course! 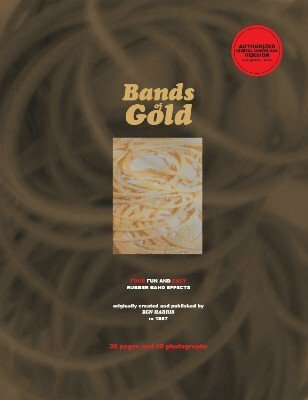 Ban Harris’s Bands of Gold utilise a deck of cards as well as an elastic band (or bands) in some very cool ways. Never before in elastic band magic have I seen effects that use bands and cards simultaneously in this way. The opening trick in this gorgeous book is just cool. A mini bet in which 2 bands are shown around the card case width ways. One will win the spectator $100 and the other one will win the magician $100. One is selected by the spectator without equivoque. Of course it’s just a normal band. The other is removed and there is a $100 bill attached. Such a mini trick but so hard hitting. The best thing? It’s brilliantly clever. Very simple and uses some very old methods in band magic but in a completely new way. A couple of effects follow suit and indeed use the same sort of principle. Sleight of Band. Another stunning effect and really can be imagined as a one trick download on one of these new polished sites. It’s just wicked. A band that’s wrapped around the deck lengthways rises up and down them deck. It begins wrapped around the whole deck. With a wave, it’s seen to jump up through the deck and now be wrapped around just half of the deck. It continues to jump up and down the deck in an incredible way. It really is an awesome trick. Rising card plots have been on the increase in recent years. But what better way to do it then with the elastic band. It’s fast growing to take over my normal rising card trick. The final is one of he best in the book. A card visually slices through a rubber band and restores. It looks mad. Another one for the download generation. A great stand alone effect or in a routine. Of course every single one of the effects can be used as part of a routine and Ben gives credits and additional thoughts all the way through his book. As with every Ben Harris eBook of wonder, it’s beautifully laid out with lots of photos to help you along. This is one of his better “non cardy/ Card” books. Highly recommended!